With a list of over 1,000 subscribers, all email marketing for this agency is branded towards its vision of being relational. 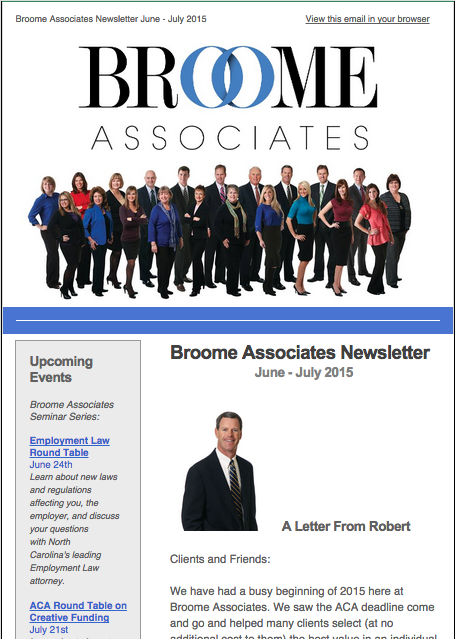 This bi-monthly newsletter was created by designing a fresh, new template that includes a letter from the president, upcoming events, new and relevant blogs, a highlighted staff member, and other updates. Text and graphics contain links back to the website and social media pages including a website calendar and share features. Created by Laura Thomas for Broome Associates.